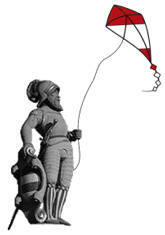 In spring 2002 a small group of enthusiastic kite flyers joined and created the "Drachenfreunde Zofingen"
- attend (showing up in a group) different kite festivals in Switzerland and some events abroad. We are neither a club nor a union. The only thing that we really are is a crowd people crazy about flying and building kites. New members are of course warmly welcome. As everybody else, we started standing on a field on our own with only one small kite. However, as we quickly realised, it's much more fun to fly with others and to be able to talk to some more experienced flyers and get useful information. We fly with single line, dual line and foil kites. In addition we enjoy driving the buggy, do landsailing and in winter we have lots of fun with the skis and the parafoil somewhere in the snow. to see interesting new kites and to meet other kite flyers. All in all we are having a great time together while practising our hobby. Apart from flying the kites we love building our very own single line kites that are shown in our kite album. We help interested and future kite flyers with the handling of the different kites and the "does and don'ts" in regards of wind and security. Should there be a big interest we could also organise a course on how to build single line kites. Should your kite suffer from a small injury, we do our best to help it get back to the sky. It´s situated between Basel and Lucerne. It can easily be found as Zofingen is situated directly at the motorway (A2) - exit Oftringen/Zofingen.